The world now knows what Asif Zardari's assets are thanks to the nomination papers he has filed. In the documents, a copy of which was obtained by SAMAA TV, Zardari says that he is a diploma holder. 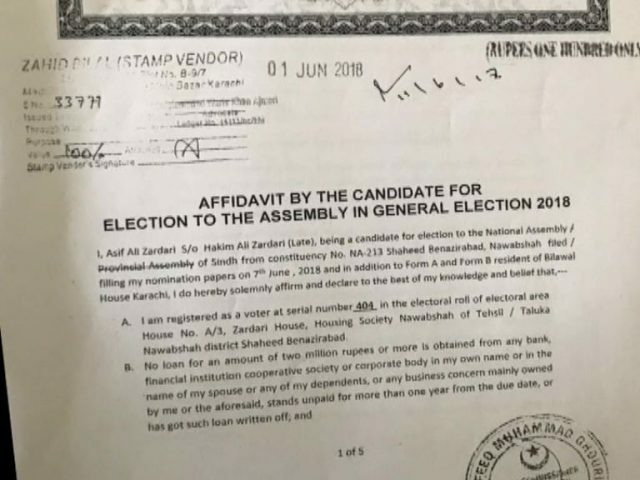 The PPP leader has filed his candidature for National Assembly seat NA-213 Nawabshah (now Shaheed Benazirabad) for the July 25 election. He has said his source of income is being a landlord. He owns 349 acres of agricultural land for which he paid Rs53 crore (Rs530m) in the last three years. He said in the document that he earned Rs353 (Rs3530m) from the land in three years. He also holds 7,399 acres of land in mukata (rent). He has stated that he is not a bank defaulter. “No loan for an amount of two million rupees or more has been obtained from any bank, financial institution… in the name of my spouse or any of my dependents,” the papers said. Moreover, Mr Zardari stated that neither does he hold foreign citizenship nor any foreign passport.